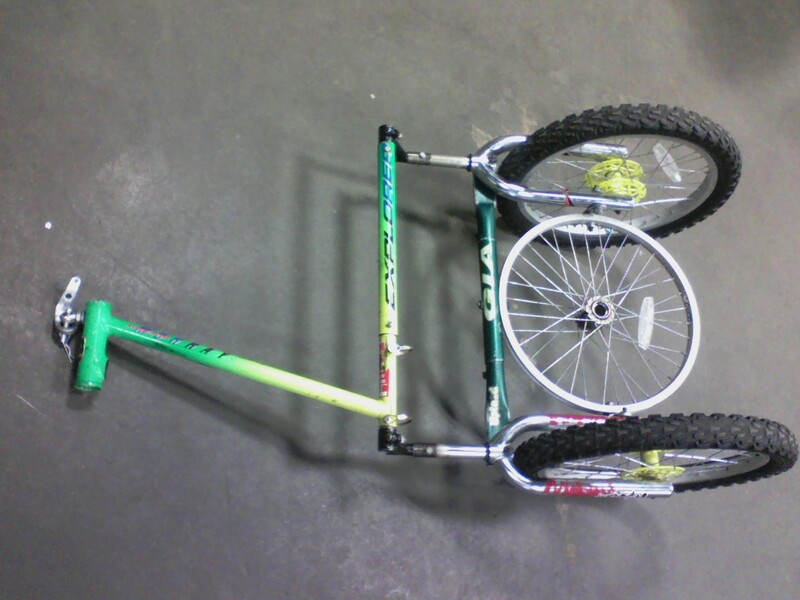 BikeCart.org | Build your own cart! 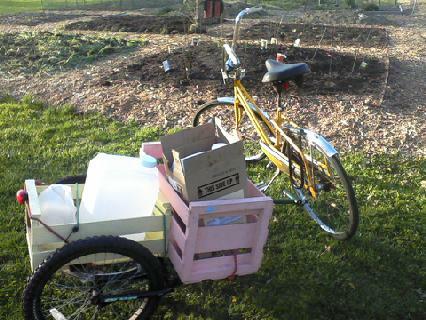 New layout for bike and garden cart, with inserts from prototypes for clarity. I move around, so so do my projects. Sometimes ending up on the backburner for years or even decades. At some points along the way, available facilities and conditions come together which allow the process to move forward. This seems to be one of those times. Look at older posts on this blog to see the beginnings of this project. 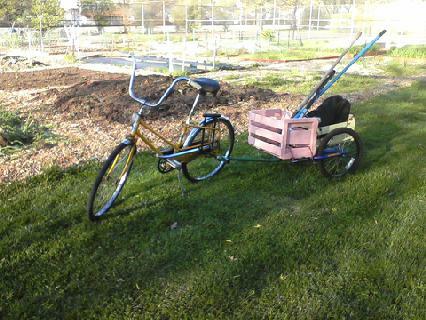 We are starting to do the BikeCart project again at BikeWorks, a not for profit bicycle coop, in Silver City New Mexico. This shop was started and is still run by Dave Baker, whom I know from Yellow Bike in Austin Texas back in 2001 or so. 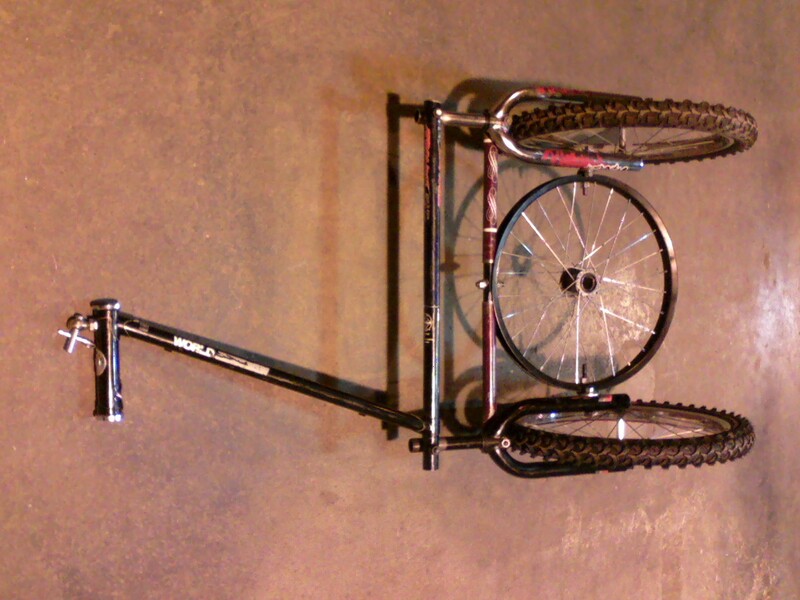 Dave has Built and used bike trailers for years and has a couple of current designs that are working well. He has a well-equipped welding shop at the Root bike shop located in an old Armory, leased from the city. He also has a small mountain of unlikely to be restored bicycles that he has hoped to turn in to trailers, garden carts etc. These trailers are custom built to order and start at $200.00 with basic wheels and tires. Contact Dave at Bikeworks to place an order and get an indication of delivery time, about 30 days right now. For more information or to talk about further customization come up to the Root shop on Wednesdays 2:00-6:00, and talk to Bart and I will show you what we could do for you. The reason I did this project, and this blog in the first place was, to work through the process, create, and present the trailers so that others could build them. I don’t know how many people tried building one based on these numbers but I guess a fair number of people looked at it anyhow. I hope to expand on this blog. 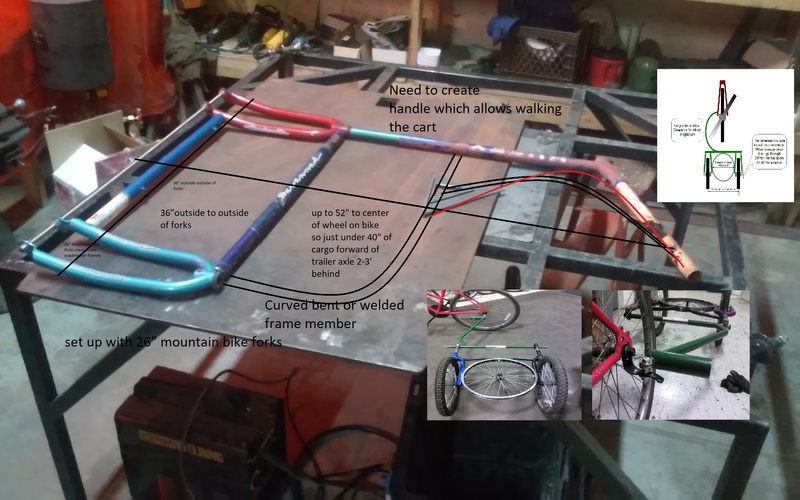 I’m creating a space in which to continue with the trailer development as well as expand ing in to pedal power machines and electric generation. On a personal level, the means to power the equipment I use throughout the day, is part of a more sweeping process of actualizing the smaller glass concept I’ve been working towards. We are building a trailer for Earth Fest here in Cleveland. 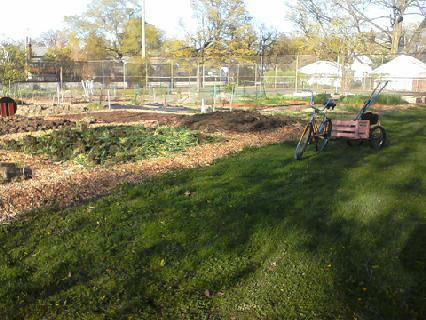 We want as much green stuff as we can get on it. I rough fit the frame elements in the fixture, while another volunteer prepped the wheels.